One Last Chance to Win One of Two Puff the Magic Dragon, the Pop-Ups! That’s right! We’ve got two more books to give away. 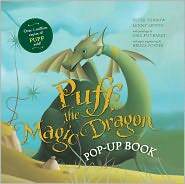 Puff, the Magic Dragon Pop-Up, which we shared with you earlier last month, is the delightful new edition of the much beloved book, Puff, the Magic Dragon, inspired by the song written by Peter Yarrow and Lenny Lipton (and of course, made famous by Peter, Paul and Mary!). Congratulations to last week’s winner, Carla! The contest runs through Monday, January 16th! Follow the instructions below to learn how you can enter the contest! 15 Responses to One Last Chance to Win One of Two Puff the Magic Dragon, the Pop-Ups! We love the original book. A pop-up book would be amazing! I’ve got the heart of a dragon. Roar! I’ve got two small (but ferocious) dragons running around my house! Nah, I let the dragons keep their hearts where the belong. I got this for my nephew a few years back, and he loves it. He knows all the words to the song, too. Now I’d like to read it to me daughter. Would LOVE this for my niece and nephew! I have the Burgess Meredith cartoons on VHS tape and I love sharing them with my kids! A pop-up book would be amazing! Just getting to the pop-up book stage. This would be fun! I would love this to read to my daughter! I think everyone in my family have dragon hearts 😉 Would love to have this book as an addition to the dragon stuff we already have for my wonderful daughter! My 4.75 kiddos would love this! And I definitely have the heart of a dragon, as evidenced by ky dragon tatt! ! and now I have flight of dragons stuck in my head because it rimes with heart of… oh nevermind.